Me nua me da wo ase. I've been able to set my keyboard up with the help of your tutorials. This is one the best things to happen during the last days of this year. Thank you very much. - David A. Say something good. Every day. 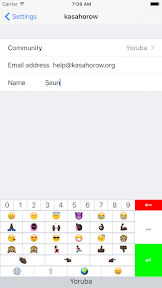 Use the kasahorow app on your iPhone and iPad to type in your favourite African language. Complete with African emojis! We love Africa: everything about the place makes us go gaga! So we thought, let's take *one* of African's amazing things, and tell the world about it. Hence "kasahorow" which means ""many languages"" in Akan, a language of Africa. So say something good every day in Akan, Hausa, Igbo, Yoruba and more!